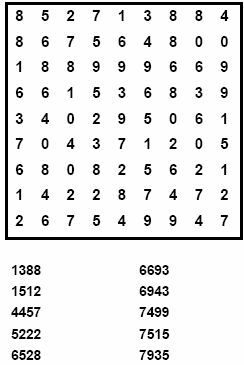 The number finder works the same as a wordsearch but rather than find the words hidden in the grid, a series of numbers are hidden in the puzzle, facing up, down, left, right and diagonally in the four orientations. For a sample puzzle, please view the Number Finder Puzzle sample. These puzzles are available for purchase on a grid of any size with varying numbers to find in the grid; hide just one number or hide many numbers - fully customisable as per your requirements. The solution for each puzzle is on the second page with the numbers ringed. Each number is hidden in the grid just once, no matter how short or long the number is.